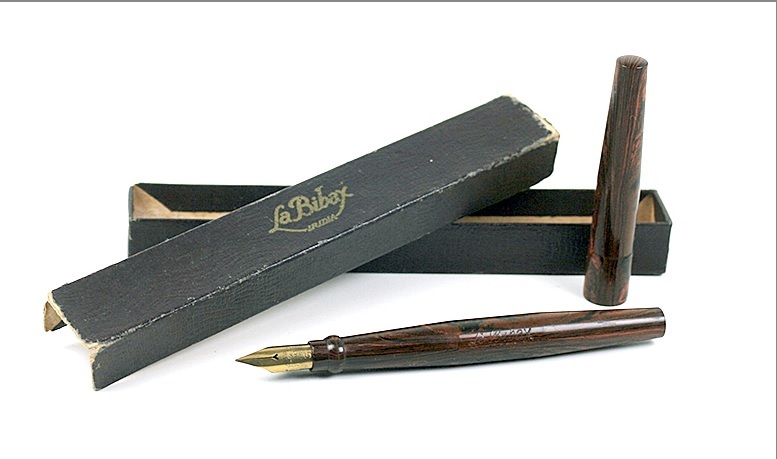 This 1924 La Plume D’Or is a very special pen. The Bibax capillary-fill Taper/Cone Cap in Red Mottled Hard Rubber is extremely rare. While the barrel is a hollow hard rubber tube, it is NOT an eyedropper-filler. How on earth does this pen fill, then? There are four long slots in the back of the feed. The filling design is to put the pen, nib down, into an ink supply, and the barrel fills through the principle of liquid settling to its own level. The ink in the barrel now acts as the ink reserve. Correct nib (medium) signed “D & D Paris 18 cts 3.” “D & D” stands for “Demely & Degan,” the founders of La Plume D’Or. Information found in “Une Affaire de Stylos” Quintette (1990) [in French language only]. Barrel imprint “Le Bibax B.S.G.D.G. Unis France.” “B.S.G.D.G.” is the abbreviation for “Breveté Sans Garantie du Gouvernement” which means “Patented without State Guarantee.” New-old-stock. Mint in original box (one end flap missing from box cover). Very rare, very collectible! This was available in Catalog #78, Item #3 – subscribe to our future catalogs to be among the first to see the newest selection of vintage pens! 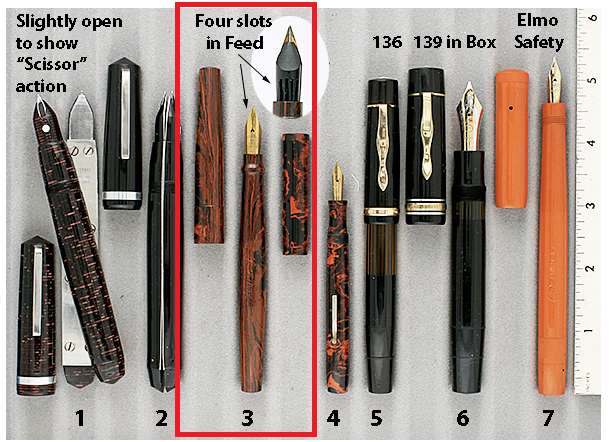 This entry was posted in Vintage Pens and tagged Extraordinary Pens, La Plume D'Or, Vintage Pens. Bookmark the permalink. Follow any comments here with the RSS feed for this post. Post a comment or leave a trackback: Trackback URL.